9445 Fangpyre Truck Ambush is a Ninjago set released in December 2011. 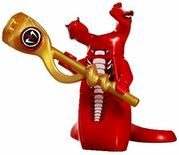 It includes a large, tailed snake-like truck, a small snowmobile for Zane, the Fangpyre Snake Staff, Fangtom, Fangdam, Zane ZX and Jay ZX. The tail of the snake truck can whip side to side. It has the ability to "eat" the ninja and has suspension. According to Ninjago: Masters of Spinjitzu, you need the Shurikens of Ice to use Zane's snowmobile, which is because the Shurikens of Ice transform into Zane's snowmobile. However, despite this, this set comes with Zane's snowmobile and the Shurikens of Ice, which is impossible. Fangtom is exclusive to this set. This set was featured on Episode 3 (Snakebit) of the Ninjago: Masters of Spinjiztu TV Series of Season 1:Rise of the Snakes. 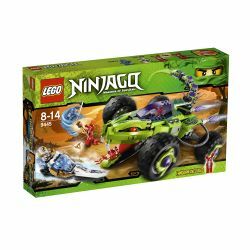 So far, is is the known sets for Ninjago to have 2 vehicles in one set, The other is 70504 Garmatron. Zane's Snowmobile is the only ninja vehicle that never converts and is the smallest amongst the four. In an image of this on LEGO.com, Zane is mislabeled Jay ZX, and Jay is mislabeled Zane ZX. Facts about "9445 Fangpyre Truck Ambush"